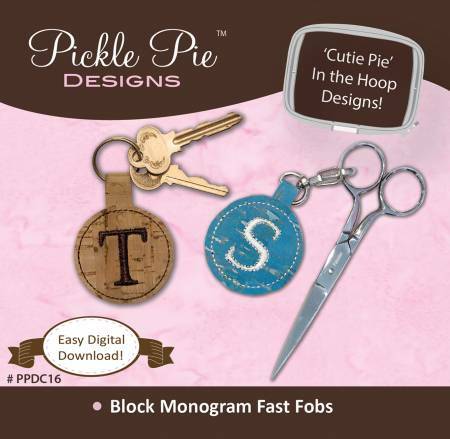 Block Monogram Fast Fobs CD from Pickle Pie Designs. Create unique gifts for guys or gals when you stitch these quick fobs for keys, scissors, backpacks, and more! Beginner: File formats include: ART, PES, EXP, JEF, VP3, HUS, VIP, and DST. Cork Bloom Bags from Pickle Pie Designs is a floral accent wristlet cases in 2 sizes. File formats include: ART, PES, EXP, JEF, VP3, HUS, VIP AND DST. 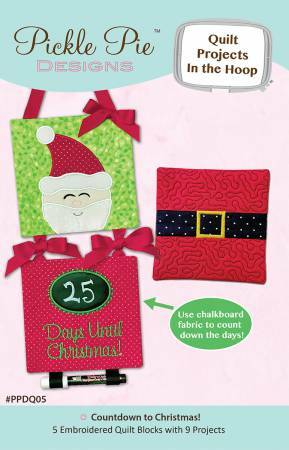 Countdown To Christmas Quilt Projects In The Hoop Designs Collection CD from Pickle Pie Designs. 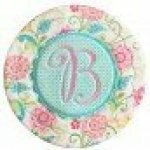 5 Embroidered quilt blocks with 9 projects. File formats include: ART PES EXP JEF VP3 HUS VIP and DST. 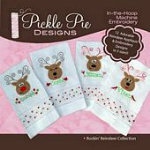 Easy Peasy Ponytail Bows from Pickle Pie Designs. Stitch sweet ponytail bows that really are easy peasy to make! change up the fabrics to go from sweet bows for a little girl, to sophisticated prints for a grown gal! 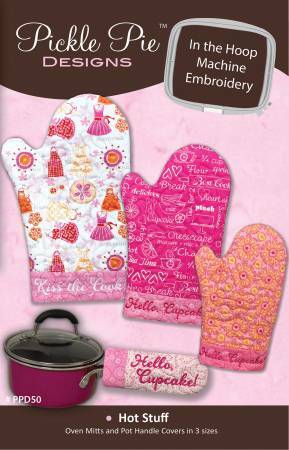 Hot Stuff Oven Mitts CD from Pickle Pie Designs. 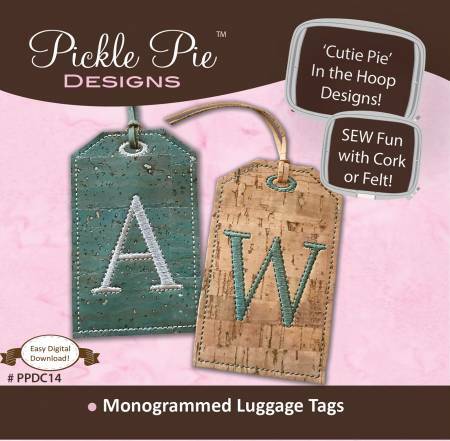 Monogrammed Luggage Tags from Pickle Pie Designs. 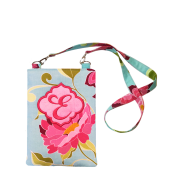 Stitch up handy luggage tags with cork fabric or felt. The clear vinyl back pocket fits a business card. The simple, yet sophisticated, font makes these tags great for guys & gals alike! 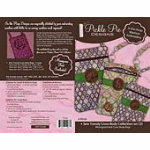 Sewing Machine & Posy Candy Cuties CD from Pickle Pie Designs. File formats include: ART PES EXP JEF VP3 HUS VIP DST. 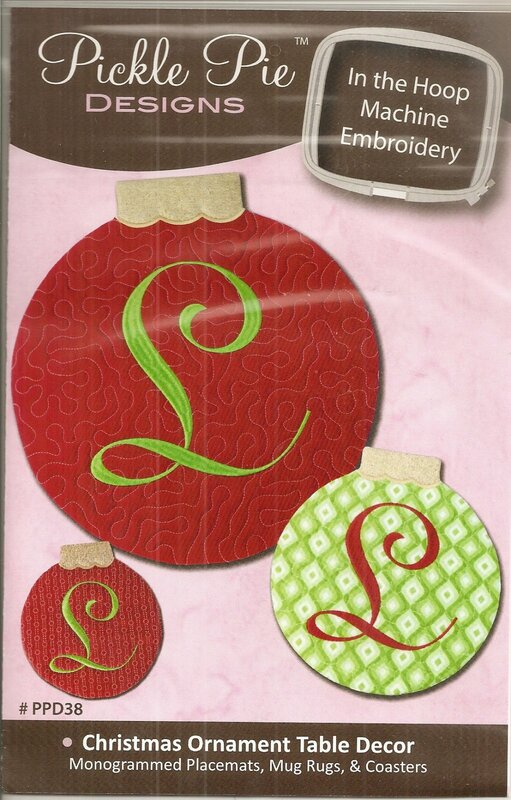 Vine Monogram Appliques Embroidery CD from Pickle Pie Designs. 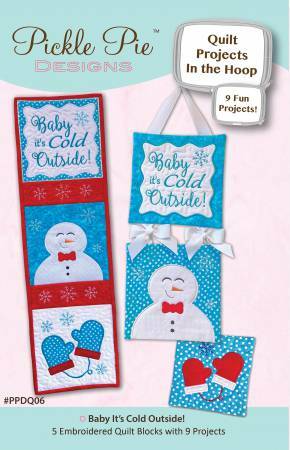 Gorgeous Applique Font in 4 Sizes. File formats include: ART PES EXP JEF VP3 HUS VIP and DST. 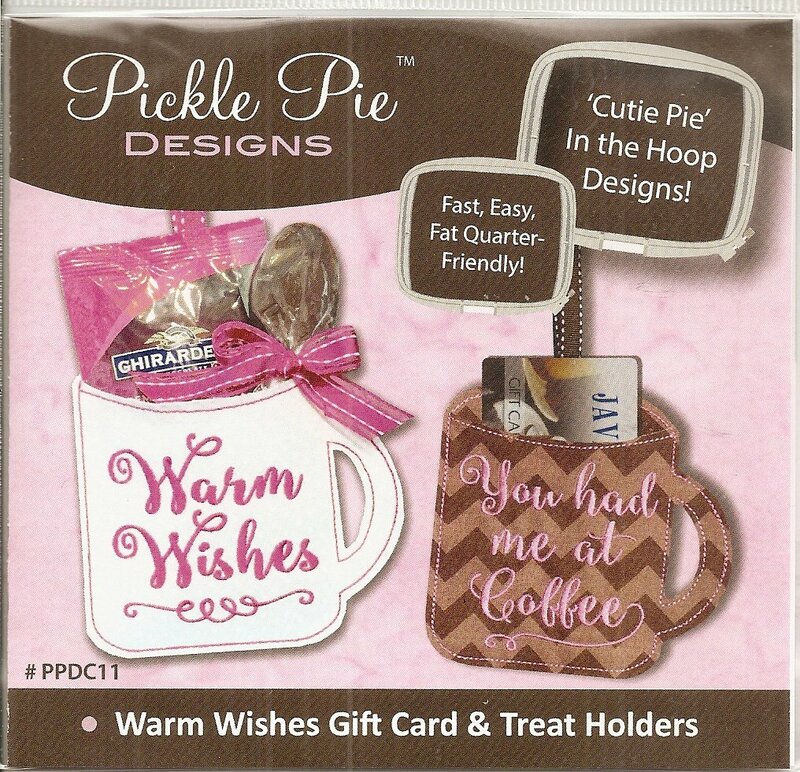 Warm Wishes Gift Card & Treat Holder from Pickle Pie Designs. 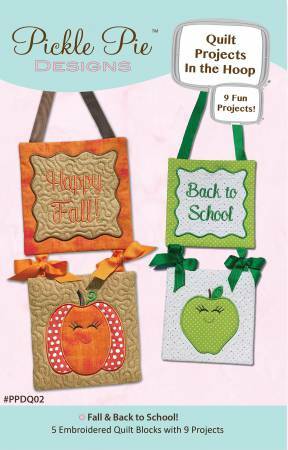 Fast easy fat quarter friendly. 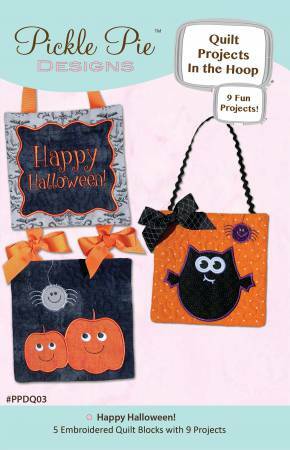 "Cutie Pie" In the Hoop Designs! File formats include: ART PES EXP JEF VP3 HUS VIP DST.